Hi everybody! Greetings from a rainy Perth, Western Australia. I think it has been 16 degrees in Perth and Scotland today. I am pleased that it has rained as we can get a bit short of water here. My mum is relieved as we have just planted some new fruit trees in our garden. Hopefully next year we can eat home-grown passion fruit, apples, mandarins and oranges. You were right- I called myself Pavlova after the Australian dessert, though the name doesn't sound very Aussie to me! I had a look at Anna Pavlova, the ballerina, on You tube dancing Swan Lake. She was very graceful. Today I had leak and potato soup for lunch. I helped my Mum make it at the weekend. I had a tiger bread roll with it-our bakers call it a tiger cub! 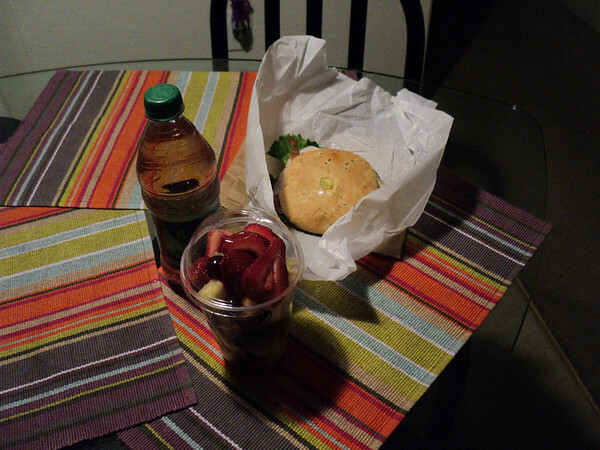 I also had strawberries, a yogurt and the rest of the cookies. It was delicious. Health rating- 8/10pretty healthy though we stirred some cream through the soup. Amount of his packed lunch my brother brought home uneaten- even more than yesterday! Number of Olympic medals won by Australia- 4- one more swimming silver today. 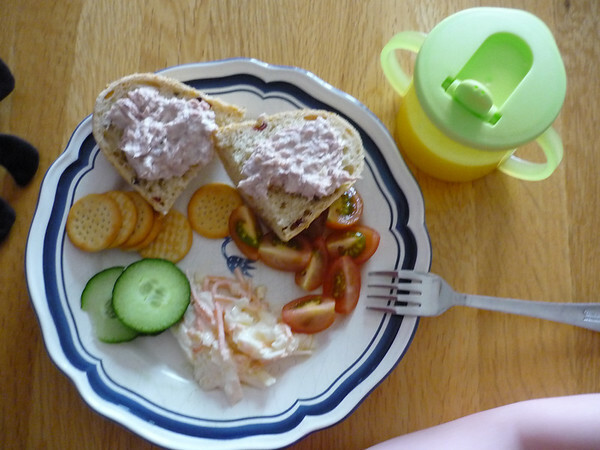 My Mum thought that my brother would eat more of his lunch if we put it in the blog. It doesn't seem to be working so far! Our school is a “crunch and sip” school. We are allowed a small tub of pieces of vegetable or fruit on our desks to crunch on through the day and a bottle of water. It is supposed to help us concentrate and encourage everyone to eat a portion of veg or fruit everyday. 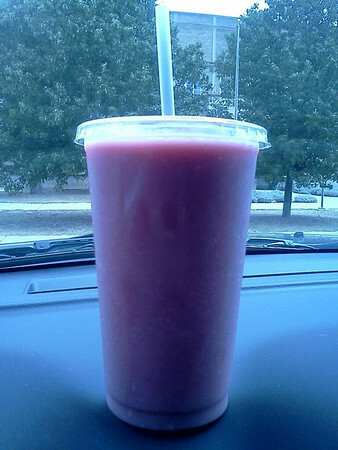 Today I had grape tomatoes for my crunch and sip. I think it is a great idea and stops me getting hungry in class. Some people asked for the traffic light food lists to help us choose healthy options. Here is a link to the website. 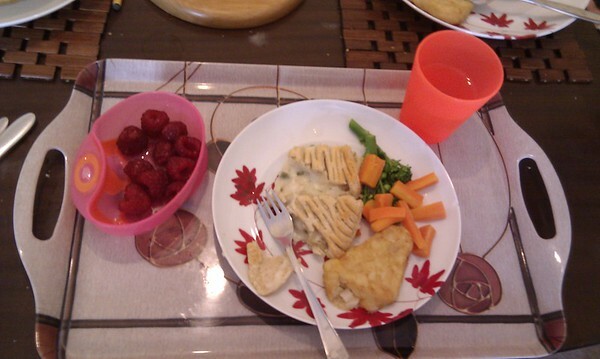 Max sent in a picture of his lunch. He comes from Warton, Lancashire. I need practise – it took me over a minute to find it on the map! I like the sound of Freckleton nearby. Does everyone have freckles there? I've never had stripy cheese before Max. 'My name's Max and I'm in Year 3 (I’m nearly 8) at St Paul's School Warton near Lytham St Annes in Lancashire (How many seconds)? 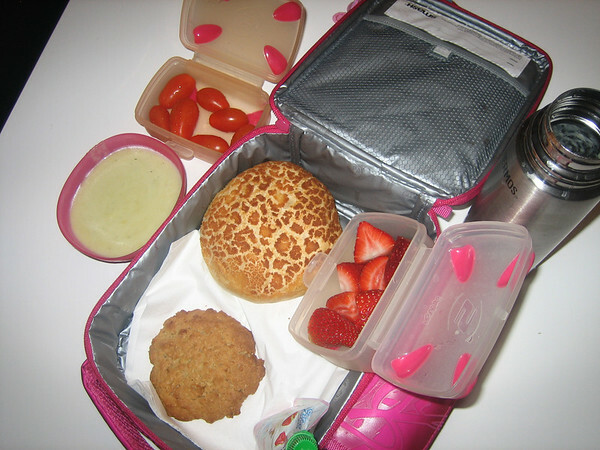 I always take a packed lunch to school every day and here is a picture of today's. Tuna sandwiches, peppers, tomatoes, cucumber and a chunk of Stripey Jack cheese. For afters there's a KitKat (somewhere in there) and pineapple. My mum always makes sure I've got a healthy lunch and unusually for an 8 year old I love my salad and veg! I usually eat them first and then have my sandwiches. In summer my veg is from our garden. We grow peas, beans, carrots, onions, potatoes, rhubarb and pumpkins. 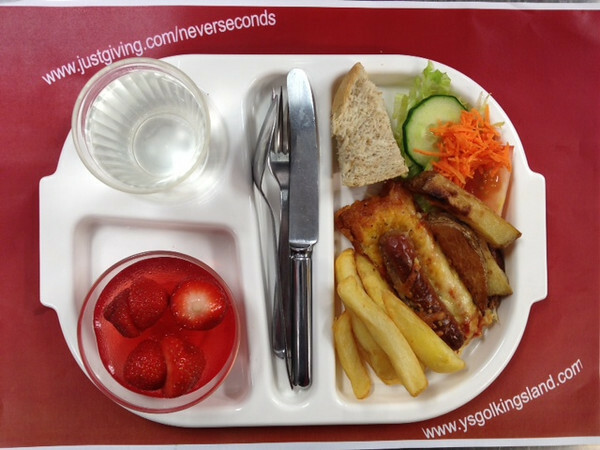 Our school meals seem to be pretty good and they have a special lunch every term that you can have. They are usually themed as to what we are learning/doing. I will write more tomorrow. Until then a question…Which capital city is closest to Perth, Western Australia? I had omelettes at my friend's house last week. 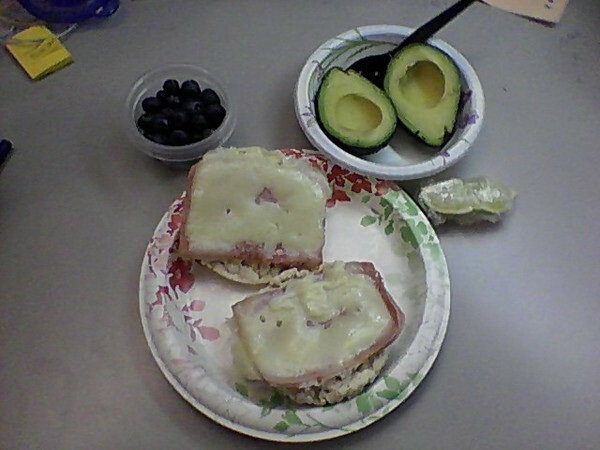 I haven't had one since school ended and I really like them so I decided to make one for lunch. I had to go down to the hens to get the eggs but I remembered to turn off the electric fence so I didn't get a shock! I cracked three eggs into a bowl and added a splash of milk and some pepper then beat them. I also put in some blue food colouring but it mixed with the yellow and made a green omelette! I sprinkled some ham and grated cheese on as I cooked it. 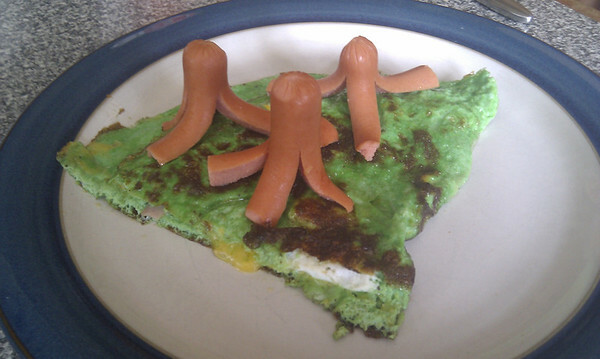 You can see why I wanted to a make an omelette sea now, for my octo-dogs! 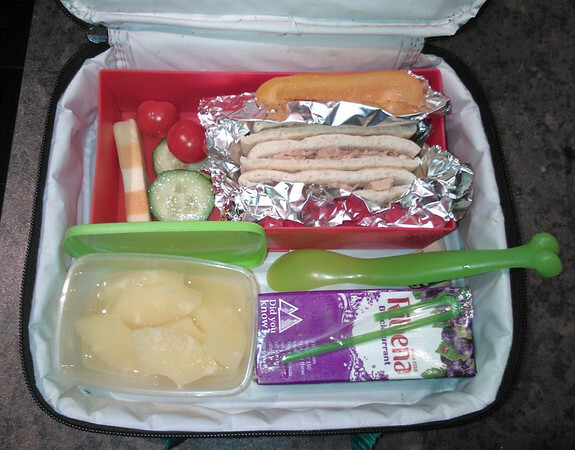 Thanks for the idea Bento Mama. 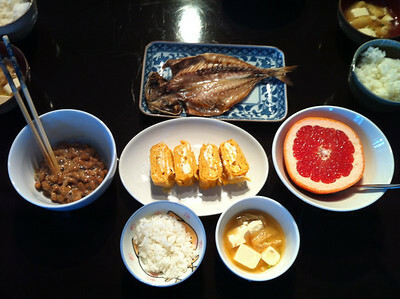 Tomorrow I am making my Japanese breakfast. I will ask you all to rate it. I am enjoying Pavlova's blog but it is unfair that her Australian winter is warmer then my Scottish summer! A company wants to use my photos to make a white board programme for schools so I asked her for a donation for Mary's Meals and she gave £50. That's brilliant and we are nearly at £113,000! Hello Pavlova from Perth, Australia! Hi Everybody! My blog name is Pavlova and I am 9 years old just like Veg. I live in Perth – not in Scotland- but in Western Australia. Can you guess why I have called myself Pavlova? 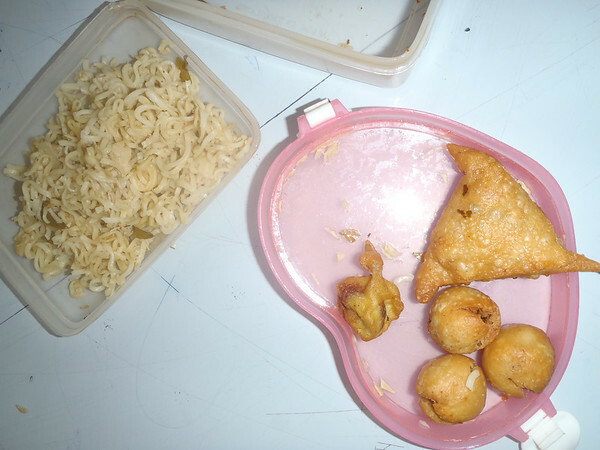 I go to Dalkeith Primary School and we don’t have a school canteen so I have to take a packed lunch every day. We all eat outside our classrooms on the shady veranda. It is like having a picnic everyday. Here is a picture of my lunch today. I had Vietnamese chicken spring rolls filled with grated carrot, coriander, capsicum (that’s red pepper) and the left over chicken from my Sunday roast. It was delicious dipped in chilli sauce. I had fruit salad after though Mum forgot to pack a fork so it was a messy business! I had an oatmeal cookie for recess which was tasty too. Health rating- 9/10- lost a point because of the cookie though it was homemade. Price- difficult to say as was bits of leftovers from our Sunday lunch though about $3.00. 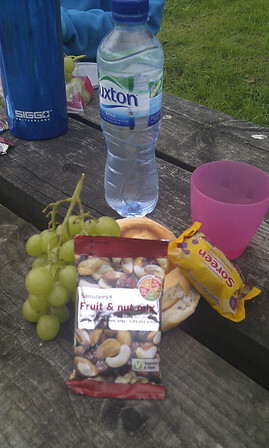 Amount of his packed lunch my brother brought home uneaten- about half and all of his fruit! Number of Olympic medals won by Australia- 3 one of each color! At my school we are not allowed junk food as we have a healthy eating policy. There is a traffic light system of food. Food on the red list is not allowed. This is sugary and unhealthy food. We can have food from the amber list sometimes and we must try and eat lots of healthy stuff off the green list. As Veg said it is winter here in Australia but it has been a beautiful sunny day. It was 23 degrees. I have just checked online and it is 14 degrees in Scotland though I guess you may still warm up a bit this afternoon. It great news that Veg has been nominated for the great Scot award. I hope she wins. I am really excited to be in filling in for Veg this week. See ya tomorrow! Veg's dad here We've had a great science project sent in by the William Campbell College in Nowra on the south coast of New South Wales, Australia. So over to Steven who is 7 years old. 'My Australian food that I chose is Ginger Beer. My mum buys ginger beer for me and I love it. 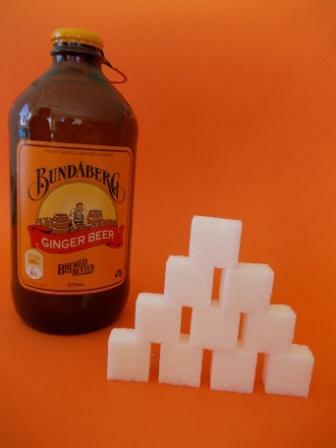 Ginger beer is “red” food. That means you can only drink it sometimes. The main ingredient of Ginger Beer is ginger, and it tastes really good. It’s not like other beer, because it doesn't have alcohol in it, so kids can drink it too. One serving is one bottle(375ml) and it has 40g of sugar! Ginger beer is my favourite cold drink. If I was allowed to, I would drink it every day! It's been a great week. At last I can tell you that I have been nominated for the Great Scot Award this year! A really nice lady came with her cameras and took lots of photos. I had my Mary's Meal t-shirt on and my Mary's Meals mug with me. I don't know who nominated me but I think it's really for everyone that has supported Mary's Meals. I am visiting the Friends of NeverSeconds kitchen in Malawi when the ceremony takes place so if we win I can share the award with all the children. Fingers crossed. I really liked all the meals on the blog this week. Thank you for sending them in. The Octo-Dogs look brilliant! As a project I am going to copy the Japanese breakfast from Asuka. I will photograph it and rate it. I have never had a breakfast like it and I hope my family like it. 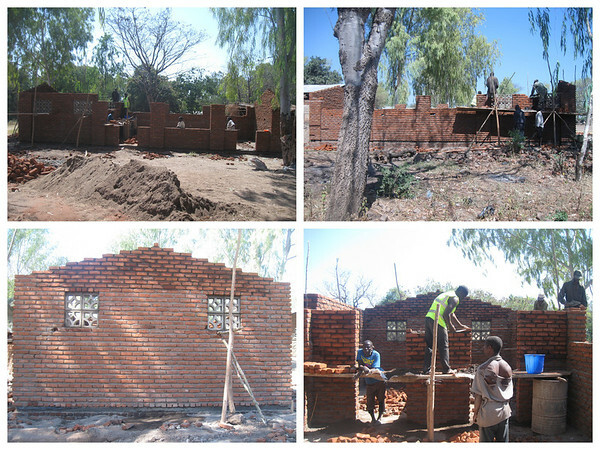 There are only 61 days until we set off to Malawi. This week Dad booked our flights. It is very exciting but I need to have 2 injections on Thursday. I have forgotten what it's like to have injections but it was ok when I was younger so I will be fine this time too. We have been watching the Olympics. I stayed up to see the three Malawi atheletes but fell asleep and almost missed the end. Next week the blog is in Perth, Australia (22 seconds). It is winter in Australia but I wonder whether it is warmer than Scotland still. The week after, it goes to Brazil just like the Olympics! My name is Nicole and I live with my 4-year old daughter Tal, in Israel. During the week, Tal is in full-time daycare and eats breakfast and a cooked lunch there. But Fridays and Saturdays she has a light lunch at home and then a cooked dinner. 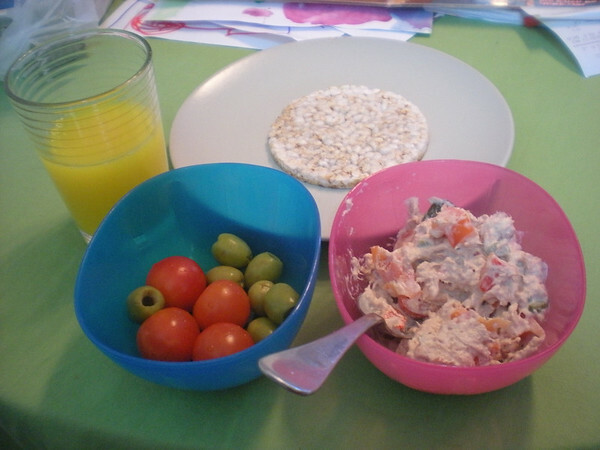 Dinner today consisted of tuna salad (Tal’s request), rice crackers, pitted olives, cherry tomatoes, and freshly squeezed orange juice. In addition to what is in the photo, she asked for an extra rice cracker after she finished the first one, and another half glass of juice. After she finished, she ate a plain unsweetened yoghurt. The only vegetables Tal likes are cherry tomatoes, but she doesn’t seem to notice that I sneak cut-up red capsicum and cucumbers into the tuna salad – and she really likes that. Hi VEG, my name is Jamie and I have a 21 month old son Mason. 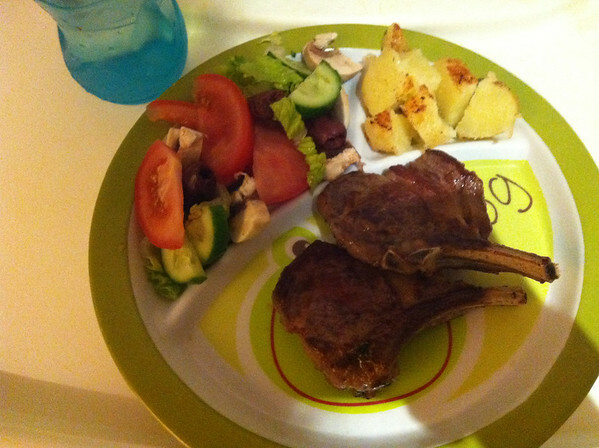 We are from Sydney Australia and for dinner tonight we had barbecue steaks and Mason had lamb cutlets with roast potato and salad. Howdylydoodly everybody, my names Jessica! 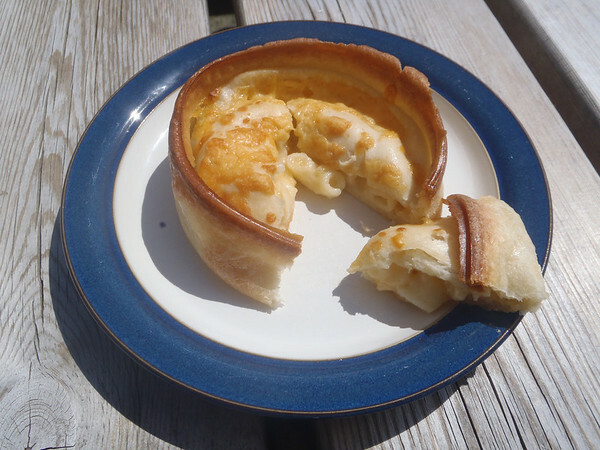 I live in the English countryside in a small village with my little girl Julie, I absolutely love reading NeverSeconds blog; it has given me so many ideas on how to vary my daughters dinner! Julie is 6 years old and loves baking and helping me cook the meals herself, she is probably more willing to try new things than I am! Her favourite thing to make is cranberry muffins, she runs off to her room to lick the bowl clean when we have finished making them, and I'm left with everything else to wash up! 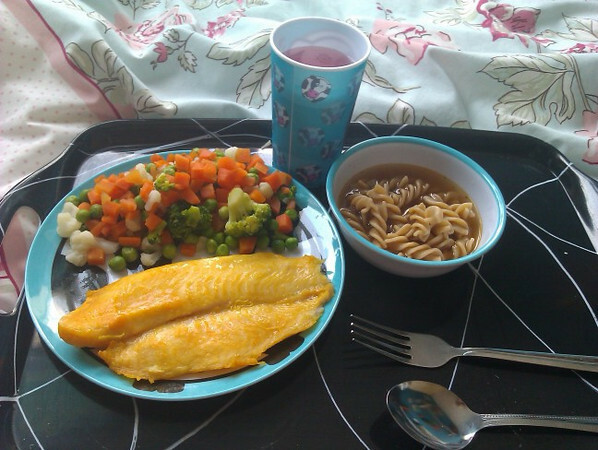 Today for her dinner I made her Grilled Smoked Basa fish, with lots of mixed veg and a small bowl of wholemeal pasta in a some vegetable stock , I have to overcook the pasta till its really mushy because she won't eat it otherwise. 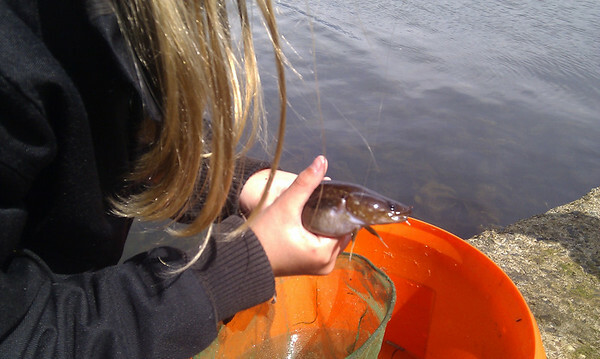 I also I had to help her finish the fish because I had given her a very big fillet, her own words claim it to be 'Very scrummy!' though. Later on she had a milkshake made with milk, ice cubes and coco powder all blended up. I was going to take a picture but she had already drank most of it by the time I found my camera! Food-O-Meter: She gave it a "8 maybe 9"
Mouthfuls: She lost count! A lot though because the veg kept falling off her spoon! Leftovers: Nope, apart from a lone pea! It's an honour to be starred on such a great blog, I hope VEG never stops! Bento Mama here sharing one of my family’s (even French toast hating Mr.Bento!) favorite breakfasts with you! Being a full time working mom, a part time student, and having between 4-6 people living in my home at all times, I’m all about doing things as efficiently and cost effectively as possible with ideally minimal amounts of waste. I recycle almost everything, reuse and repurpose where possible, and generally find as many ways as I can to save money, and the environment. Many people have asked me if bento making creates a lot of waste with all the bread, meat, and cheese scraps. The answer is a resounding YES… and no!! While bento making creates lots of scraps, I have taken to saving them (in either the fridge or freezer) for use in different meals! 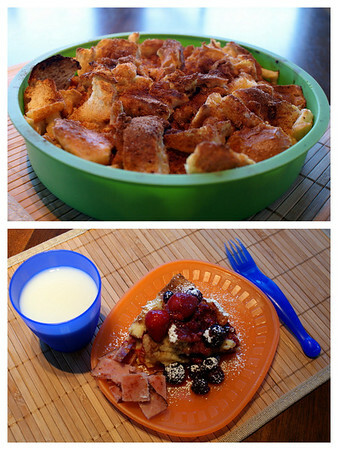 This super delicious French toast breakfast casserole is an excellent example. All my sammie scraps go in a bag in the freezer for use in this budget friendly and super easy meal! I served today’s breakfast with fresh sautéed berries (strawberries, raspberries, blackberries, and blueberries) and a little icing sugar for garnish. 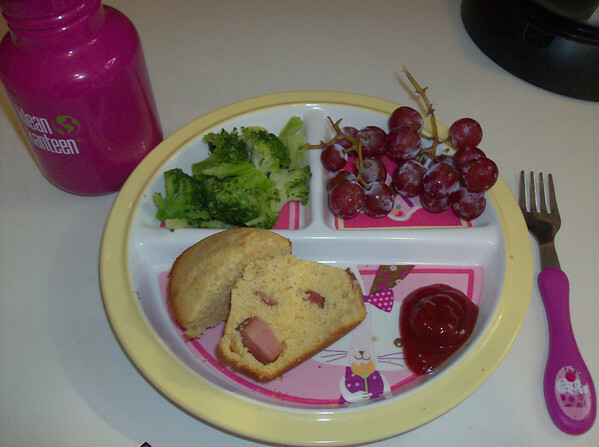 The kids also had grilled ham and a glass of milk to balance out the meal. Mouthfuls: Lots! Little mouths take lots of bites! Price: Super cheap!! This meal is made entirely out of leftovers!! Dining time: 21 minutes and the plates were licked clean, and it would have been longer if I didn't bribe the kids with cartoons! If you want the full recipe to make your own super cheap breakfast head over to my blog. If you’re not a fan of cooking, but still want a cheap meal, head over here to help NeverSeconds provide meals, and a kitchen with Mary’s Meals to children in Malawi! A mere £10.70 or $16.92 Canadian will feed a child for an entire year! Thanks again VEG and Daddy VEG for allowing to me participate in this amazing initiative! Hi there, from Columbus, Ohio. My name is MIMI and I am a mom to 3 kids, ages 2, 3, and 5. All of whom are rather picky eaters. I've had to find lots of ways to incorporate good, healthy, well balanced meals that are kid friendly and look appealing to my kids. That's why I almost always "sneak" the healthy into my kids food. I do this by pureeing a lot of veggies and fruits into everyday items. After I am sure my kids like a food item and have tried it several times, I always let them know what healthy items I hid in their food, that way, when I present the food to them later in it's natural form, they are more willing to give it a try. They seem to like the food and are now a lot more open to strange foods. My daughter gets upset now if I don't somehow use spinach in a food item. I've been known to sneak spinach in everything, even in brownies! Here is our dinner from today. It is sneaky mac n'cheese muffins. Noodles, with cheese on top, but hidden inside are pureed beans, spinach and tomatoes. There are also cut up hot dogs and an egg to make it very protein enriched. I've also included carrots, peanuts and half a banana as side dishes. With a cookie for dessert and a glass of milk to drink. 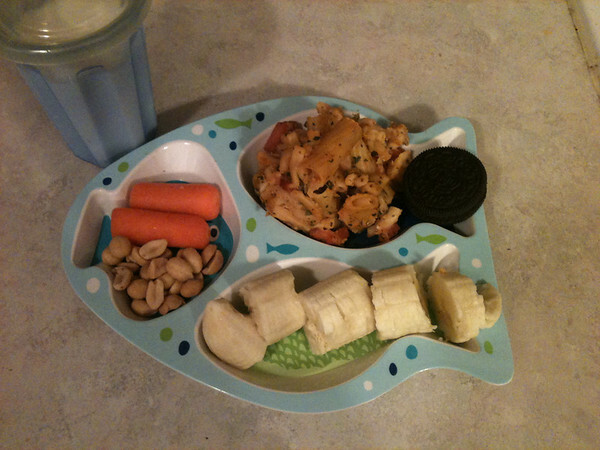 With preschool aged kids, portion sizes need to be smaller, and variety is key. They aren't very big kids so they don't eat as much as adults, and they need to see a food 5-8 times before they decide definitively if they like something or not. So I always put lots of small portions of different items on their plates. 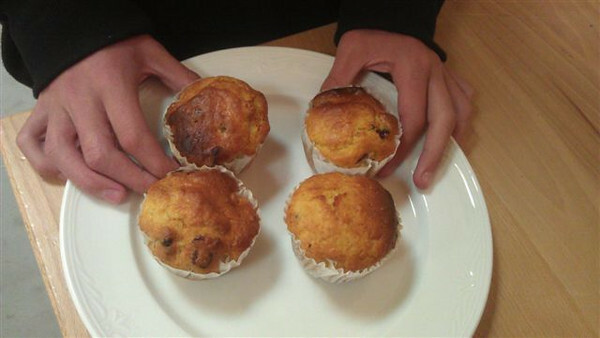 Food-o-meter-8/10, the youngest wasn't sure about the mac'n'cheese muffins. Mouthfuls- a lot, it took well over an hour to get all 3 completely done. Price-about $2 per plate plus I have enough leftovers for another meal or two. In France, little ones start school in the year they turn 3 so neither of my monsters are pre-schoolers anymore, but since we are in France and as there is no canteen at the school, I still get to feed them three times a day as they come home every lunchtime. 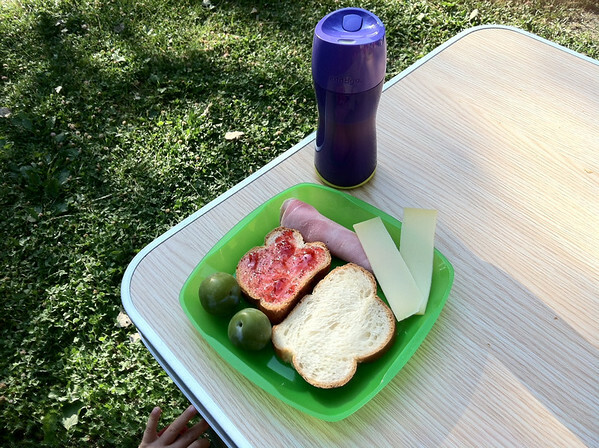 There is a lunchtime option at school by an external provider, but it's expensive at 6.50€ (£5) per day even if it is starter, main, cheese, bread and dessert. Only about 20% of the school children eat there. Mouthfuls: we forgot to count, but if H is enjoying food it disappears in big mouthfuls so probably not that many! Hope you enjoyed reading...we're off to see the Aletsch Glacier this morning, hope the breakfast sees us through until lunch...then again, we are on holiday, so we may find a nice boulangerie along the way! Thanks to VEG for your inspiration and to VEG's Dad for your hard work in bringing this to us all and of course to everyone for the superb amount of money raised for Mary's Meals so far - its amazing how so little money can go so far - keep it coming! My son is 4, and my daughter will be 3 in September, and they both attend preschool on the elementary school grounds just at the end of our street. When my kids started at this preschool I gave myself a goal of creating fun and nutritious lunches for them to take to school each day. 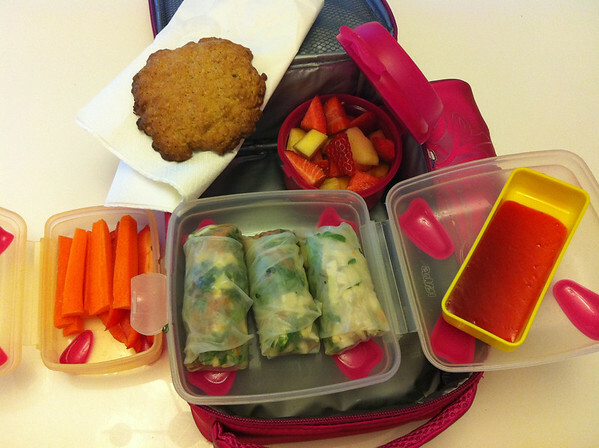 You can read about some of my adventures in bento making over at More Than Your Average Mom. My kids are in preschool Monday – Friday from about 7:30am – 4:30pm and they eat breakfast, morning snack, and lunch there, all provided by me, and an afternoon snack provided by the preschool. 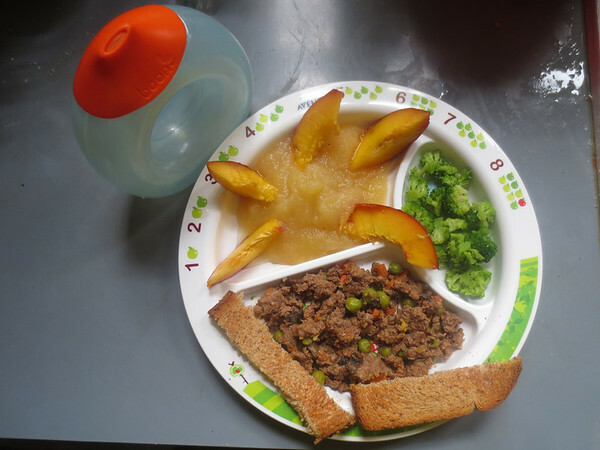 This is a stark contrast to my homestay students who eat FIVE meals a day at, and provided by their school in China which they attend from 9:00am – 9:00pm Monday – Friday. I try to follow the Canada Food Guide when making my kids lunches, incorporating each of the 5 food groups with a little flair to make it fun for the kids! Today’s lunch is an Under Sea Adventure! 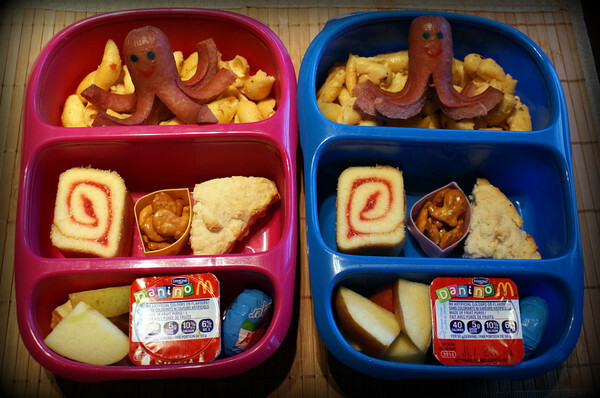 My kids love these Octo-dogs, and homemade cheesy pasta shells are always a hit too. Everyone got a left over homemade biscuit from last nights dinner, as well as some goldfish pretzel crackers to go with the underwater theme. Yogurt, apple slices and a mini cheese will make up the kids snack, and the illusive 6th food group (junk food) is covered with the jelly roll! 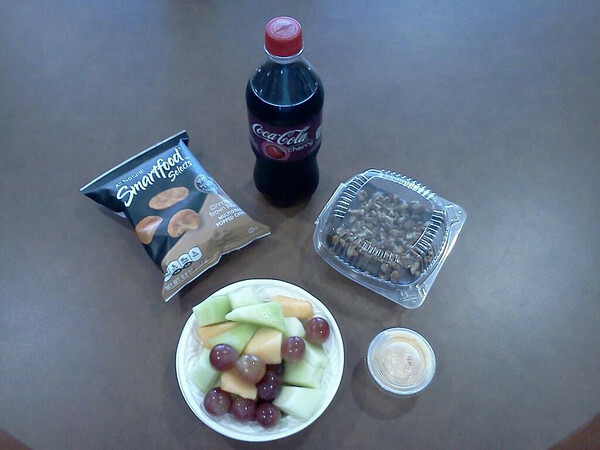 A well balanced and fun lunch on the menu today! Dining time: 28 minutes!! That’s a long time for lunch, but numerous musical interludes of the “slippery fish” song delayed us finishing in a normal amount of time! A big huge True North thanks to VEG and Daddy VEG for letting me guest post today! I’m absolutely honoured to be able to share my lunches with you, and hope that you’ll take a moment to share a lunch with Mary’s Meals by donating over here. It costs a mere £10.70 or $16.92 Canadian to feed a child for an entire year! I hope you've enjoyed my lunch, as much as I've enjoyed making and sharing it with you! Hi! I'm mother of three from Finland. I have two sons, 7 and 8 years old ones. They are going to primary school 1st and 2nd classes when new semester starts in August. My daughter is three years old. I'm homemom for her and childminder for three other kids ages one to three. I make and serve breakfast, lunch and afternoon snack for these little ones every Monday to Friday. 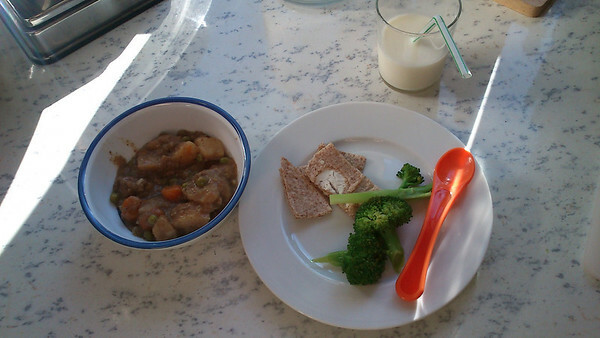 Boys get their free lunch in school like every kid in Finnish schools, other meals they eats in home. 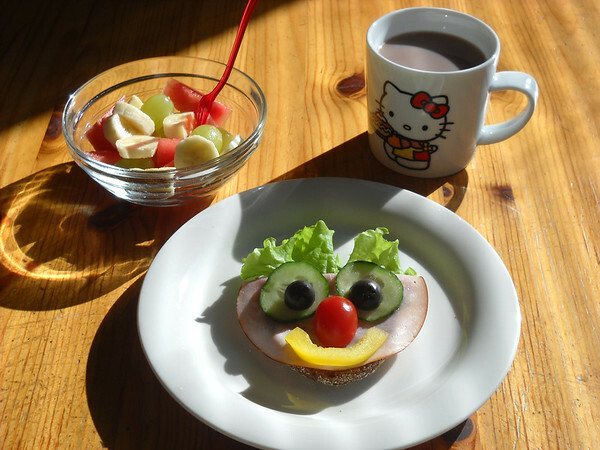 This time I like to present you most typically breakfast for my daughter. It contains rye bread with very thin slice of smoked ham and some veggies (lettuce, cucumber, cherry tomato and pepper), bowl of fresh fruits (grapes, watermelon and banana) and cup of hot chocolate. Healthy: 9/10 I take one point off because of hot chocolate, 'cause I can't find the better option with less sugar last time in store. Price: I think less than 1€ or £0.80 for her portion. Hi, I'm Joy. I live in Cambridge, England, but I was brought up in Scotland. I have two children, Emily who's three and a half, and Fraser who's nearly 9 months. Fraser mostly eats purees and it's hard to get him to comment properly on the food(! ), so I decided to write about Emily's dinner. I also interviewed her about it. We try to cook our meals ourselves, but sometimes it's nice to have a break and go for something easier. So this evening we had chicken and asparagus pie from the supermarket, with hashbrowns, carrots and broccoli. We had fresh raspberries for dessert. Emily also had a yoghurt (actually a fromage frais). But it wasn't in the photo as she only decided she wanted it later. Me: what do you think of the food (main course)? Me: what's your favourite bit? Me: what don't you like? Emily: 1,2,3,4,5 lots of numbers! Me: which do you like best? Me: how healthy is the food? Me: do you like the dessert? Me: what's your favourite dessert? Me (surprised): do you like raspberries more than icecream? Me: what's your favourite fruit? Emily: cos it is. Why? Why? Why? Fraser actually had a mashed up raspberry for the first time. He screwed up his face, said "Eeurgh" and spat it out. So prob 0/10 then. Mummy and Bubba here from Sheffield This is my babies breakfast from today, he is 1 year and 1 week old. As you can see he loves his fruit! Today he has had cherries (his first try of them, he loved them!) 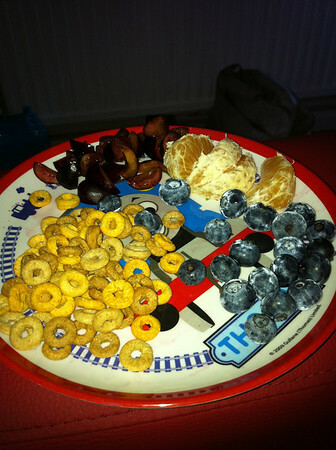 satsuma, blueberries (favourite) and Cheerios. He likes food he can eat with his hands as he is too little to use a spoon properly and is far too grown up (he thinks) to be fed. There was a sippy cup of milk too, but it didn't get into the picture. Mouthfuls- millions! He eats things one at a time! A week for our young ones! It's a great week in Texas Tech. I am enjoying the chat and debate on how our school food may influence our choices later in life. Also on our differing nutritional needs when older. So before we're back in term time and back in primary schools I thought a week of the food we give our kids before they go to school would be fascinating. We have received many lovely emails from Mums and Dads offering to guest blog so here's your chance. Please send an email with your post, a picture just of the meal, and rate it like VEG. For this week only it's ok for the parents to write! It can be breakfast, dinner or tea. If you'd like to send your email in a foreign language I'll post that with a translation (please include) as we did for Wales. I'd really like to have 3 meals a day for next week and travel as far as we can across the globe. One of the reasons I'd like to see what we give our youngsters is because we will be visiting a Mary's Meal under 6 feeding centre in Malawi. Mary's Meals offers these children two meals a day as 'because their young age makes them more vulnerable to the effects of malnutrition'. 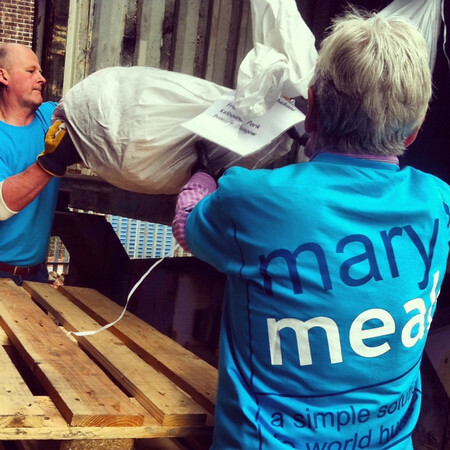 It costs just 6p for a Mary's Meal, that's £10.70 a year, so please make a donation and we'll show you the difference you are making when we visit in October. Looking forward to your contributions. I wonder where the preschool tour will kick off? VEG's geography skills will be tested! Hello, y’all on a HOT Thursday afternoon! CJ here! Today, our writer says he prefers to be called “GeorgieJoeBrown,” which is quite a mouthful, so maybe, GJB??? He studies Rhetoric, is a fellow “ginger” like me, and I can tell he had fun writing this post for all of you! GJB here I have to admit, when I was first asked to do short bit for this blog I hadn’t the slightest clue as to where on Texas Tech’s campus I wanted eat at and write about. What started out as a mission to find a unique place to write about has without a doubt turned into an obsession that will last for the rest of my time in Lubbock, TX. At this point it may be helpful to give a little background on the restaurant itself. COWamongus! opened in February of 2005 thanks to the generosity of a TTU/Food Tech Alumnus and is today housed inside the university’s Animal and Food Science building. What makes it unique in relation to the other dining options on campus? First and foremost, the establishment is run by the Department of Animal Science itself. It has nothing to answer to outside of the university, and is staffed by students. This is a stark contrast to the other options on campus which tend to be fully staffed and operated by an outside corporation. What makes COWamongus! the true treasure of Texas Tech is far more exciting than merely local operation, however. Plainly put, the answer lies in the food itself. All of the meat that is served at COWamongus! is produced by the university itself. The livestock is raised on Texas Tech’s ranch, processed, and cooked all by Tech students. This is about as wonderfully American as you can get, and to jump the gun a little, the effect on the food is fantastic. A bacon cheeseburger with tater tots and a coke. American enough to make you hum yankee doodle and delicious enough to make every other dining option want to go back the drawing board. I mean, what’s not to like? It was hard to turn down this dish when I noticed the majority of everyone else around me indulging themselves in it. The beef was cooked perfectly. Juicy enough to hold the flavor, but firm enough to stop the whole thing from falling apart. And the bacon, oh…the BACON! I had to pinch myself a few times to make sure I was awake on account of its being so good. Not a floppy mess, mind you, but crisp and skinny. To be completely honest, if you’ve looking for the healthy food option, you may be barking up the wrong tree with COWamongus!, though there are a few tidbits you should consider before writing it off completely. First off, this isn’t your normal processed and shipped meat chucked full of preservatives and who knows what else. The beef is brought in fresh daily. The bacon is brought in fresh daily. Frankly, you’re not going to find a much more authentically healthy option anywhere close, unless you’re running a farm and driving cattle in your spare time, of course. Food-o-meter: I'll give it the best just because it was fantastic. Mouthfuls: 8-10, depending in how big your mouth is. Add 30 more for the tater tots. Guns-up meter: 5/5. This is about as guns up as you can get. CJ back just to wish y’all a good night, and remind everyone that with all we’ve paid on our meals at school so far this week, we could have fed three kids for about a year through Mary’s Meals. Thanks for your continuing support of VEG’s great cause, and please keep those donations coming. I hope one day the only debate we have about food is whether or not we made healthy choices, because we all have choices to make, and no one has to worry about having food at all. I’m excited to wrap all this up for you tomorrow, and pass the torch (… seems appropriate since we all know what special event is coming up in sports next week!) to the next guest blogger! I’m excited to begin reading posts by VEG again, too! I know we all miss her! Thanks, y’all! Hello again from West TX! I have been really excited to read the comments and feedback from everyone so far! I had never thought about my Food-o-meter ratings compared to VEG and some of the other writers from around the world. Most of those meals have included a bit of all the “food groups.” I tend to eat very “light” lunches consisting of fruits and veggies and perhaps a grain. I rarely eat a protein with lunch, because I incorporate them into breakfasts and/or dinners. In an American cafeteria setting, most of the proteins are highly processed, or sometimes greasy or high in sodium. I try to pick the freshest thing available to me. On Monday, outside of the salad station at that particular dining hall, there was pizza, a grill (mostly fatty things like cheese steaks or burgers), stir-fried options prepared in a wok (but nothing looked very fresh), and a Tex-Mex station that had tacos, burritos, and huge “fiesta” bowls filled with high fat options. Given my choices, I decided on fresh cut fruit. I was nice and cool with our hot weather and the freshest option available at the time. I do have a bad habit of sipping on sodas sometimes, and I don’t think in our public school system that children can choose them as an option anymore. But, it was so hot that day that nice, cool water was swapped out after the picture. (I also thought it was neat to find out that it isn't available worldwide!) 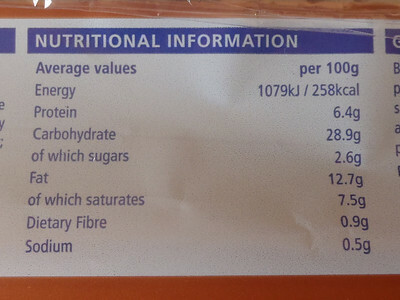 The multi-grain chips/crisps are something brand new, and I looked at how low in fat and calories they were. They were really lightly dusted with the flavor, but I didn't check the carbs. I had a protein (beef) that night with dinner, because I can better control its freshness and preparation at home. Also, I couldn't eat a brownie that big in one sitting, but quartering it after diner made a little three-bite treat, and I haven’t had a bite of what was left over yet. As for Tuesday’s smoothie, I had made a vegetable scramble (eggs and veggies) that morning with some bread on the side, so having a bit of fruit and yogurt to carry me through until I went home to make a healthy dinner seemed OK at the time. Our First Lady has been working to improve school lunches and encouraging kids to get active. Healthy choices are often sacrificed for the sake of convenience here. We also suffer from what Americans call “portion distortion.” I’m not sure other areas in the world have as much trouble with that one. Some mayors and governors in the US are even trying to get food laws passed regarding portions, warning labels for fast food, etc. I try to do the best I can on-campus, and really focus on health in what I make for myself, but kids don’t get to make those kinds of decisions, so I’m glad that many adults are campaigning for healthier options to be available to them. I hope adding a bit of context helps. I really admire VEG for not only raising awareness about areas where children don’t have food at all, but also raising awareness of where the quality of and choices for food need to be improved. Our prices are really high, but people that purchase a campus dining plan save a lot (20%-50%). I’m not sure that it’s worth the investment for me, because usually I only eat on campus 1 to 2 times per week, which leads me to an introduction! Now, after maybe adding some context to American options, without me rambling anymore, let me introduce Joy, a fellow master’s degree student who is helping me to team blog this week. There aren't many grad students who eat on campus every day, so a group of us is contributing to the posts! Enjoy, y’all! I’m a graduate student at Texas Tech University in Lubbock, TX. How many seconds??? Texas Tech is the second largest continuous university campus in the United States. (The Air Force Academy is only bigger because of the runways.) Our mascots are Raider Red and The Masked Rider, and students are known as Red Raiders. 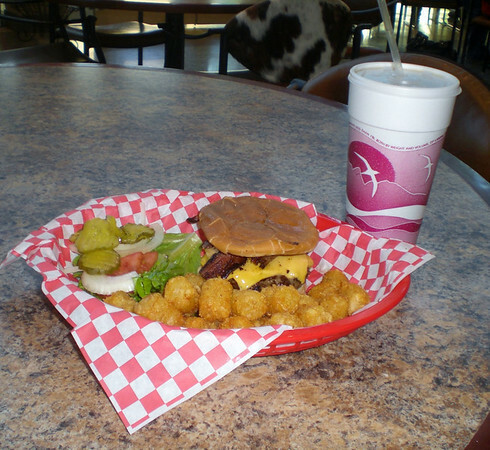 We even call Lubbock “Raiderland.” Since the campus is so large, we have dozens of dining options around campus. The goal this week is to offer a sampling of what different choices our on-campus eateries offer to diners. 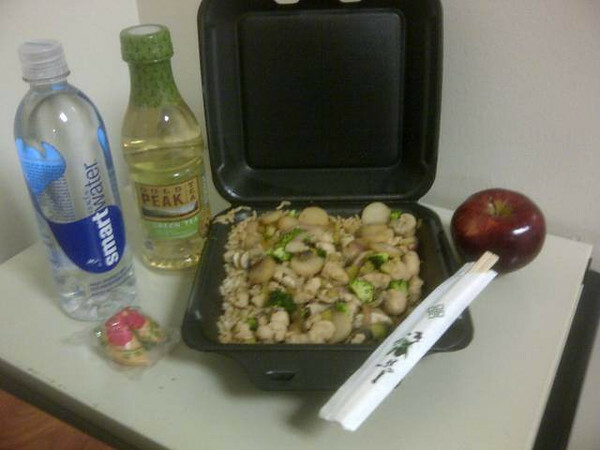 So, without further ado, here is my Monday meal! Today I ate at one of the dining halls inside one of our residence halls, which is conveniently close to our new College of Business building. There are many stations with many choices, and today I visited the sandwich and salad station. I had a fruit bowl with yogurt dressing, some multi-grain chips sprinkled with brown sugar and cinnamon, and since I chose such healthy items, I also picked out a big brownie with fudge icing and pecans sprinkled on top for dessert. (I was too full for the dessert, so my mom- who is visiting me- and I each ate a quarter of it after our dinner.) There is a Cherry Coke in the picture, but I ended up drinking a bottle of water instead. This last one refers to a gesture we make with our hands when we cheer on our sports teams. We say “Get Your Guns Up!” I thought my enthusiasm for the meal would be 0, 1, or 2 “guns up.” Today was pretty good, so 1. I hope you enjoyed reading a bit about Texas Tech! I’m excited to keep sharing with you this week! about eating healthy and fresh, and that our kids know it too. the greatest, but here it's good - better than where I graduated. Pieces of hair- 0 - never found one here, gratefully! 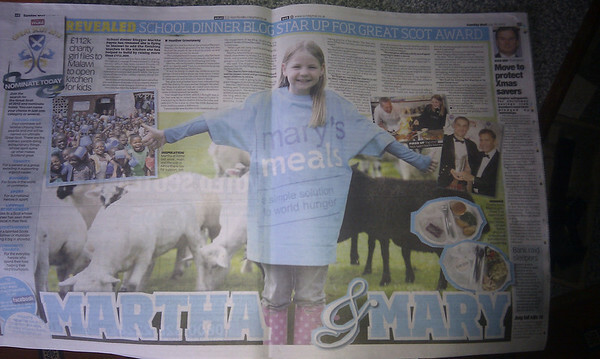 Also… one more big congrats to VEG for her work with Mary’s Meals! 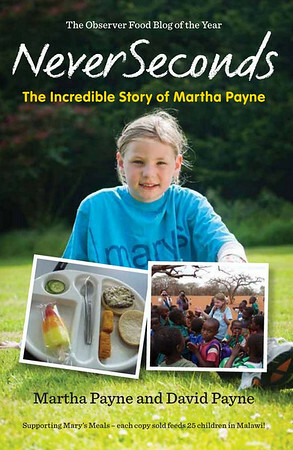 I would like to remind all the readers to check out the website, and for my fellow US readers, there is a Mary’s Meals America! Keep the donations coming and assist VEG in helping to provide schoolchildren a healthy meal everyday at school! Time zones and technical glitches! Mobile internet failing so post will wing its way from Texas in their evening. That's our midnight. I'll make an early start to get it published as soon as I can! Meanwhile have a listen to this The Extraordinary Food Story of Martha Payne , you may recognise the voices! It's Veg again! Our guests had an important visitor to their town today. It was the Queen and so they didn't go to lunch at school. 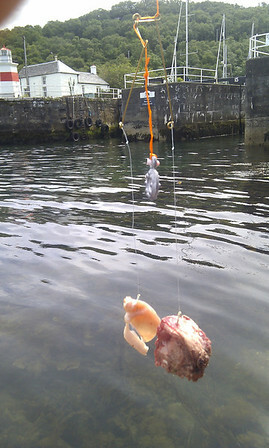 I can reveal that the best lunch for crabs is......Venison! You were right more crabs went to the bacon but they fell. The crabs on the venison hugged it with all their legs and stayed on. 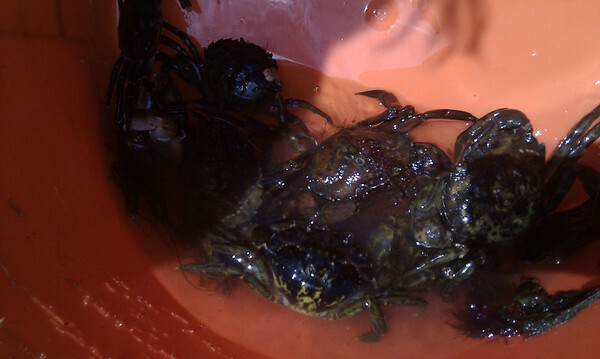 My brother caught the biggest crab so we will have to go back. Dad had to say a lot of 'colders' and 'warmers' before I found where this dinner came from. children come in from 1pm until 5.20pm. I like noodles but I am not sure about the gulas. I can't imagine how they taste but they look crunchy. Maybe I should try and make them for my lunch. It sounds like a really busy school. 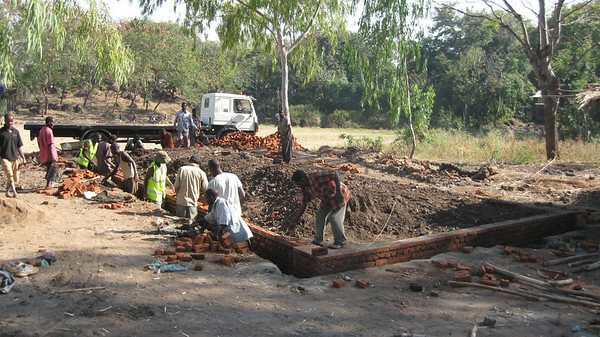 There are nearly 2000 children at the school in Malawi I am going to visit. That is a lot. We had some visitors this week from the radio. They had some soup I made for lunch but I forgot to ask them to rate it. The programme will be on this weekend. The weather is good so Dad says tomorrow we will shear the sheep! I (Not a yoghurt knitter) work at our school as a teaching assistant. ‘Not a Hippy’ is the person I support most of the time and he is 15 years old. Yesterday he had a brilliant time in the Black Mountains but has not come back with a dragon. Today he has not been with me as he was out on a quest, for knowledge, and had lunch there (day out at one of the Hereford colleges). It is all very exciting as the Queen is coming to Hereford for about an hour it seems tomorrow. NAH is going to be on parade with the Air Cadets. I hope she brings her wellies as it has been very wet and boggy here but it is sports day for those who do not wish to see the Queen. I have asked for some help from the children in Class IV who are about 9 or 10 years old. I have asked boys O and Z to comment on this wonderful lunch because I was assigned to their class today. The children at the Steiner school are not exposed to working with computers until they get in to the upper school, I think the hunt for the location will be a warm up game later in the week. ‘The curry contains cauliflower, onions, carrots and chickpeas. The sauce is a homemade sauce (nothing from jam jars here) made from ginger, garlic, chili and turmeric with onion and mustard seeds, the sauce is bright yellow and creamy. 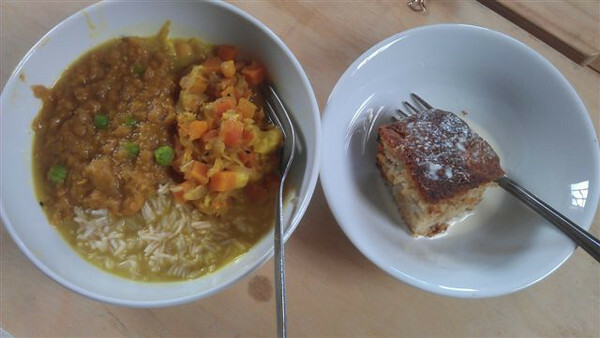 It’s served with a pea and lentil dhal and brown basmati rice. We also had a lovely light rhubarb sponge and cream or fresh fruit. The rhubarb had been grown at the school by the pupils at the school. We do lots of land work as part of the curriculum. Mouthfuls-" we were too busy chatting to count but we think it may have been about 40"
I know where yesterday's dinner is from, and the secret is safe with me! Thank you to Blod for last weeks interesting Tales from Wales. Veg is still on holiday so we "Not a Hippy" and "Not a Yoghurt Knitter" are having a week in her seat keeping it cosy. We are just over the boarder from Blod in Herefordshire. Our school is The Steiner Academy Hereford. Steiner schools are a bit different, it is a more holistic approach to education about the child and not targets. Many people think that these schools are for the children of muesli munching yoghurt knitting hippies because the children wear their own bright clothes and chunky boots not a uniform. Steiner education caters to the more creative side of a child. Usually people have to pay to send their children to one of these schools but now we are an Academy and any one can come here for free if there is a place for them. The day is structured differently. In the morning the children start off by saying a verse, they play recorder and then do movement. After that they start the main lesson. This will be the same topic every morning for several weeks rather that having a lesson of Maths, English, RE, Geography, History or Art each day. There is usually a story to go with the lesson to be remembered for the next day. The lunches here are vegetarian. The dinner ladies are some of the parents of the students. Each week the menu is the same and there is only 1 choice take it or leave it BUT the food is SO tasty and very wholesome you do not want to leave it. My favourite is the curry (Tuesday). 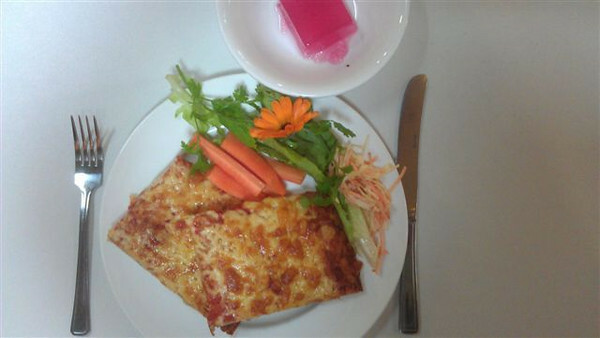 Today is pizza with carrot sticks, salad and coleslaw, with vegetarian pink jelly for pudding or fresh fruit. The pizza is crispy wholemeal base with a smooth tomato plain cheese topping with no burnt bits. 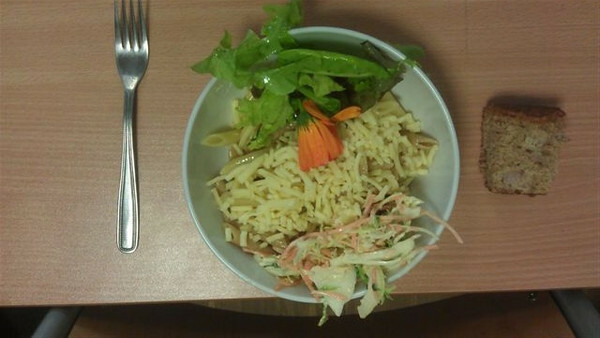 The salad is a crunchy green lettuce and fresh green herb salad with nasturtiums and marigolds in. The coleslaw was creamy. The jelly is pink fruit. The dinner ladies cook everything from scratch and everything is locally sourced or comes on the supermarket truck on a Monday. There never seems to be much waste. VEG here! Dad didn't pass a sent in meal to NAYK in time today so here's a meal from Japan. The blog is visiting Japan for week so there will be more from where this came from! "Hi, VEG! I'm a big fan of your blog. My name is Corinna, and I'm an American who teaches English in Japan. 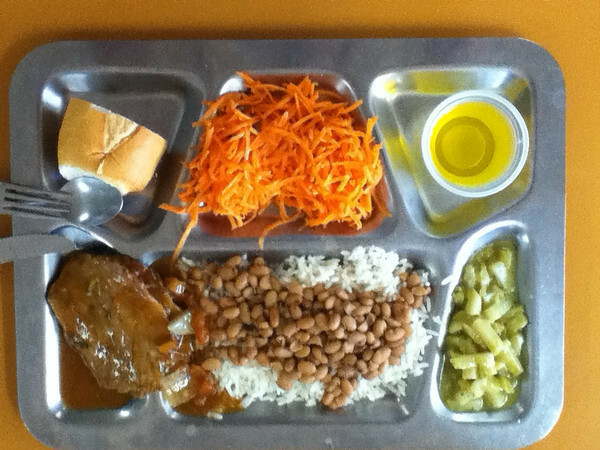 Here is a photo of today's school lunch. 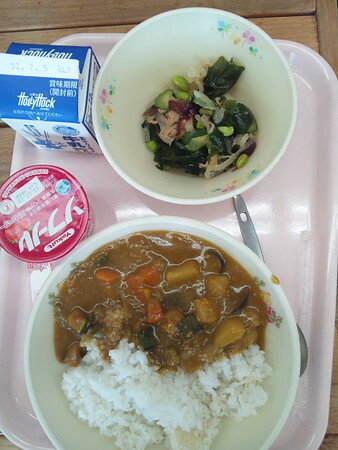 It is my favorite, curry and rice and edamame salad. Here in Japan, there is milk every day and rice at least three days a week. Only the fast eaters get seconds, but the food is very delicious, so the children play rock paper scissors to see who gets the extra! Also, the children serve each other and then clean everything up after!" Rock paper scissors for seconds, cool! Haia, BLOD yma. Heddiw roedd yna fwydlen arbennig yn y gegin i ddathlu twrnament tennis Wimbledon (oeddech chi’n meddwl mai’r gemau Olympaidd fasa’r thema?!). Gwisgodd rhai plant wisg ffansi. Mi wnes i wisgo crys-t, sgert a chap. Rydym wedi cael nifer o ddiwrnodau thema eraill, fel diwrnod Americanaidd, a diwrnod Mecsicanaidd. Fe allwch weld bob un yma, yn cynnwys llun ohonof fi a fy mrawd o heddiw. Ar y fwydlen arbennig roedd: pitsa selsig, sglodion, wedges, ffa pob, salad, a bara. Dwi ddim yn siŵr os ydynt yn bwyta pitsa efo selsig arno yn Wimbledon, ond dim ots gen i gan ei fod yn fendigedig. Ond mae ganddynt fefus yno, a dyna oedd i bwdin heddiw (efo jeli). Cymerais lun o’r mefus i ddangos i chi ond mi wnes i roi nhw i fy ffrind oherwydd dydw i ddim yn hoffi mefus. Roedd bwyd heddiw yn fendigedig. Doedd o ddim y fwyd iachaf o’r wythnos, ond roedd yn flasus, a dwi’n credu ei fod yn bwysig i blant ddysgu i fwynhau bwyd. Ond mae’r pitsa yn cael ei wneud yn ffres ac mae ganddo pum llysieuyn gwahanol ynddo. Hi, BLOD here. Today there was a special menu in the kitchen to celebrate the Wimbledon tennis tournament finals (you thought it would be the Olympics didn’t you?!). Some children wore fancy dress. I wore a t-shirt, skirt and cap. We have had lots of other theme days at dinner time, like an American day and a Mexican day. You can see all of them here, including a picture of my brother and I from today. The special menu was: sausage pizza, chips, wedges, baked beans, salad and bread. I’m not sure if they eat sausage pizzas at Wimbledon, but I don’t care because it was delicious! They do have strawberries though, and that was our pudding on some jelly. I took a picture of the strawberries to show you but I gave them to a friend because I don’t like them. Today’s food was delicious. It wasn’t the healthiest thing we have had all week but it is nice, and I think it is important that children get to enjoy food. But the pizza base is homemade and has five different vegetables in it. It's nice to be home and to see all the animals. There is a Red Squirrel outside waiting for me to fill the peanuts but Mum saw a Pine Marten this morning so I hope the squirrels will be ok. I think we have dates decided to visit Malawi in October to visit the children and the Friends of NeverSeconds kitchen but I may need some jags before I go! Ouch.